With the advancing role of police forensics in investigations today, the quality of the evidence that forensics investigations returns can make or break a legal case. Make sure that the forensics and evidence complement. each other perfectly with this DVD. Evidence and Forensics: Due Process (Enhanced DVD) No matter how cautious criminals attempt to be they always leave behind some evidence that proves they were at the scene of the crime. Whether it's a hair, a fingerprint, or even some blood, all of these can somehow be tied back to a single individual, making them key elements in any criminal investigation. In this video, the leading forensic scientists and legal minds take an in-depth look at various kinds of evidence. The leading authorities in forensics explore classic fingerprint evidence and state of the art DNA matches. The process for the collection of data is explored and proper labeling is discussed. The video details the time sensitive nature of evidence collection and juxtaposes this against the arduous process of getting evidence admitted to trial. It is important to know the limits of the various pieces of forensics evidence to make sure any legal case is as strong as possible without using questionable data. Furthermore, a full comparison is made between what everyone sees on popular TV shows and how a forensics lab runs in real life situations. This is important in dispelling misconceptions. Finally, this program will take a look at some of the challenges facing digital evidence today. The law can sometimes struggle to keep up with state of the art forensics technology making it a major struggle to have this kind of evidence admitted to court. This DVD comes with an instructor's guide online. What is Evidence? � Evidence is used to disprove or prove facts, whether they are circumstantial, direct or physical. Evidence is presented in court and used to determine the innocence or guilt of a defendant during a criminal case. In this program we learn how the police start the process of gathering evidence. Crime Scene Investigation � Crime scene investigation is a documentation of the conditions of a crime scene along with the collection of any physical evidence. Many people are involved in a crime scene investigation and they are required to follow a protocol to protect the integrity of any evidence found. What Governs Use of Evidence? 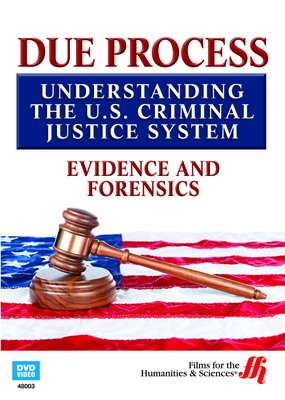 � The Rules of Evidence are used to govern the types of evidence that are admissible during a court case. Evidence has to be authenticated and it must also be relevant to the case. In this segment you will learn about the importance of the Miranda Warning, confessions, hearsay and other important details regarding evidence.